As indie iOS developers we have two roles: developer and marketer. Technology sells, but it won’t if you keep thinking like a developer. If you want to help people discover your apps, you have to start thinking like a marketer. Developers often claim that good products don’t need marketing. In this article, I’ll show you how to overcome that assumption. When something breaks, you try to fix it yourself. In fact, you like to build things yourself! The more stuff that needs fixing, the happier you are. When someone asks your help with a problem, you always systematize the solution. You define the components of the faulty system and pinpoint the part that needs fixing. I often hear developers say that good products don’t need marketing. They see products as solutions for problems, like a switch that turns on the light. When you have a problem (it’s dark), you solve it (turn on the light). If you don’t have a light switch, you buy one. When your product is a solution to a problem, this logic can make you believe that the product doesn’t need marketing. 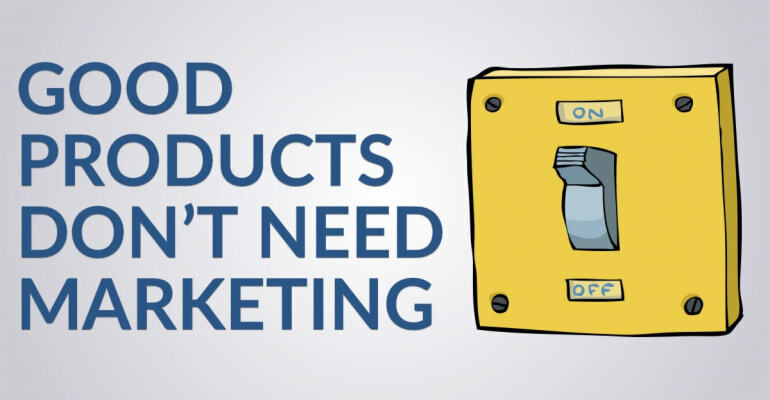 Good products don’t need marketing. I thought that was true for a long time. Since then I’ve learned that marketing is in fact very much needed. People don’t know that you or your product exists. They’re unaware that you can solve a problem for them. People don’t know what you know about the product you sell. They don’t know it can help them. Sometimes, people don’t know that they have a problem worth solving. When the original iPod was introduced by Apple, competitors marketed their products by saying it had 1 gigabyte of storage. Apple changed the story and marketed it was “1000 songs in your pocket”. This doesn’t mean that you can spam people, interrupt them or shower them with advertisements. I know marketers get a bad name by cold-calling, hard-selling and tricking people into buying stuff they don’t want or need. I think that you, as a developer, have an opportunity to talk to the people that want to hear from you. When you built a good product, it’s your responsibility to bring it to the people that can benefit from it. You can do a lot of good in this world if you can help people discover your good products. The best way to do that is to market your products for them. When you practice modern marketing1, you both benefit. 1 A term I first heard from Seth Godin. Modern marketing, according to Godin, is based on empathy, permission and effectiveness. When you obsess over products that can change peoples lives, you’re both creator and marketer. I think those nerds can change the world. The app developer and the app marketer use a different approach for the same task. They are both convinced that the value they create in the world will make it a better place. When you develop your app, you are using technology to solve a problem. If you want to solve that problem for other people, you need to raise awareness of your product. Marketing crosses the gap between the product and those that can benefit from it. It is the vehicle for change, the oil in the engine and the compass that gives you direction. Marketing is far too important to be left only to the marketing department! As a developer, you need to build marketing into your products. It’s far too important to leave marketing to the marketers! As a creator of value, you have an obligation to make it spread. Why else would you build something good? I think marketing is a selfless act. Not a selfish act, as many people are lead to believe by “Buy Now!” ads and sales pitches. It’s simpler than ever to build iOS apps. Apart from Swift, Xcode and the iOS SDKs there isn’t much else you need to get started. Even the App Store ecosystem, with all its flaws, is incredibly compact. You have all the tools you need to make change happen. Learning to code is as challenging as its always been. The Swift programming language and the abundance of online learning resources make it much easier to learn how to code, though. The App Store is maturing. You see a shift from nice-to-have apps to apps that are serving specific needs and wants. The apps that have to fight for our scarce attention are losing ground. The rising stars of the App Store are the apps that people would miss if they were gone. I’m thinking of apps like Trello, Bear, Exist, Headspace and Zapier. The App Store is moving to a new economic model, one based on the scarcest commodities of all: time, attention, and effort. But what’s that got to do with us, the indie developers? The line between developer and marketer is fading. In fact, I think they are now one and the same. When you create value as a developer, and raise awareness about that value as a marketer, I see you as a change-maker. You’re an entrepreneur. The word “entrepreneur” is borrowed from the French language. It means “to undertake”. When we think of entrepreneurship in the traditional sense, we think of capital, products and business. What an entrepreneur really does, is create change and bring it to those who want it. It’s no different in the App Store, except that it’s now the developers who are the harbingers of change. And that makes all the difference! The skills, experiences and insights you have as an entrepreneurial developer-marketer are invaluable. You’re the ultimate inventor. You can win the hearts and minds of your customers, enrolling them in the change you seek to make in the world. Start a conversation with your (potential) customers right now. If you don’t have any customers, tell people about what you’re creating and listen to what they have to say. When you include people in the value creation process, you’re much more likely to create something that is wanted or needed. Don’t build an app unless you think someone can benefit from it. The best way to figure out what people want is to listen, watch, to practice empathy and humility. Approach your work with a sense of humour. Share a laugh, listen to the stories around you, and I’m sure you’ll find a change you can make. Get out of your chair, away from your computer, and get out there. As a developer you’re great at figuring out how stuff works. Now it’s time to figure out how making change happen works. Being a leader is a funny thing. The only thing you really need to do, is show us where we’re going. As a creator, a developer, a marketer, I think you’re perfectly equipped to make that happen. Stand up and lead us. It’s your turn now. So… do good products need marketing? I’ll leave answering that question to you.